1°/ A multiple feedback active low-pass filter with a gain of about 18, a 40 Hz cutoff frequency and a quality factor of 2.2. This stage uses a NE5534 low-noise OP-AMP (less expensive than the AD797 used in the preamplifier). 3°/ A 8 pole Butterworth Sallen-Key active 50 Hz low-pass filter using two NE5532s. N.B. These specifications were determined after multiple trials at the same time making trial graphic transfer function simulations and some concrete implementations. The difficulty was to obtain a relatively horizontal response curve between 0.1 and 40 Hz and a drastic drop after 40 Hz. I have finally chosen not to totally crush the 50 Hz to obtain a frequency reference line on the spectrograms and to be able to control the recorder sampling rate. It's evident that it's possible to make different choices and obtain better or different results. The calculation details of components values is provided in order to build a system with other bandwidths, such as 0.1-5 Hz or 0.1-120 Hz. For this purpose, the recorder sample rate was fixed at a relatively high value to be able to change filter characteristics without changing the MCU programmation (see part 3). Regarding that, remember that the preamplifier contains a primary filter with a 87 Hz cutoff frequency and it might be necessary to change the C9 value (see part 1). The outpout signal may be sent to a PC sound card used as A/D converter to allow real time FFT analysis, a very useful option for the developement, or to the recorder, which is the normal system using mode. 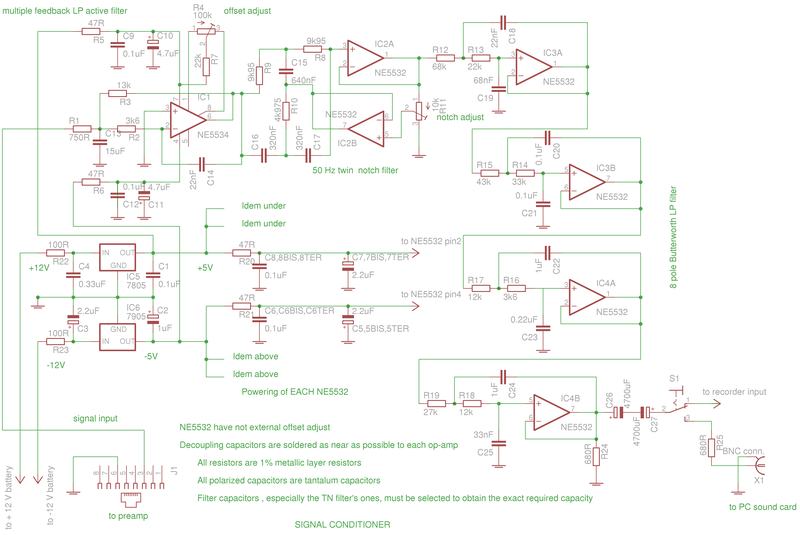 For the filters calculation (and using OP-AMP) I have mainly used Chapter 8 of the Analog Device study named Analog Device Basic Linear Design (ADBLD), which is freely downloadable on the AD site and the Texas Instruments study named Active Filter Design Techniques. 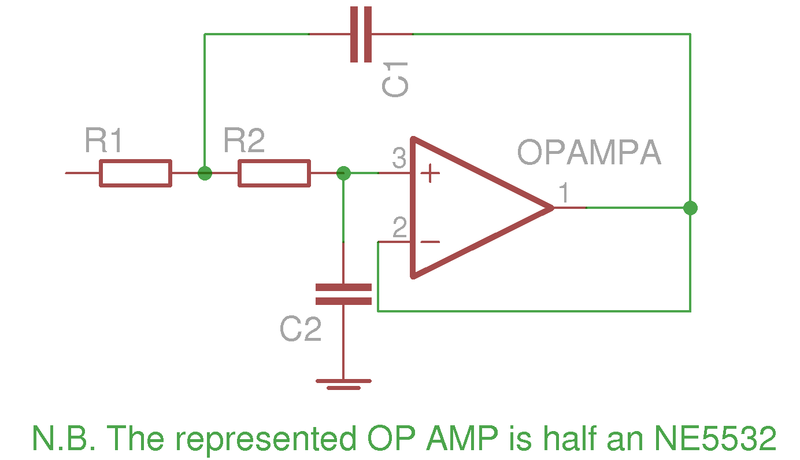 A dual 5 V power supply is used, but 3.3 V would suffice. The 2350 uF coupling capacitor C26+C27 is indispensable when the system is used with the recorder. The sound card impedance adaptation R25 does not have any absolutely critical value but its presence is necessary. There now follows the calculation details using Maple 14 (but any calculator will do). The multiple feedback low pass filter design. We can see that pole real parts are strictly negative, as it is necessary. : cutoff frequency, here 50 Hz ; ; quality factor ; I use the calculation method developed in ADBLD ch. 8, p. 8.101. We have and . We have ; there is no other equation to determine R and C and we can choose R or C. We can adopt 320 nF for C (in practice, is obtained by two 320 nF capacitors in parallel). It then results that (in practice, by testing different 10k resistors it is easy to find one ; is obtained by two 9k95 in parallel). The trimmer can be decomposed in connected to IC2 pin 1 and connected to GND. The and values determine the notch depth. We have (or ) and there is no other equation to determine and . The sum is not critical and we can adopt 10 kOhms. The transfer function is i.e. , if we set the trimmer so that , which corresponds to the best experimental result : . Note that there is a large arbitrary factor in these values and that many other choices could be made. Theoretically, the order of the cascade stages in Butterworth filter implementation is not fixed, but it's better to observe the described order “ to avoid dynamic range problems”(1). This is the global response of the system to a sinusoidal magnetic field (normal to the loop plane, i.e. when with the notations of part one). The global system gain is the module of the ratio between the outpout RMS voltage of the output conditioner and the magnetic field RMS intensity expressed in teslas. This gain, expressed in dB, is plotted in the last amplitude Bode diagram of the Maple worksheet. We can recognize the slope below 40 Hz due to the frequency proportionality of the e.m.f. induced in the loop and to the importance of the resistive factor in the loop impedance (see part one). As it can be seen on the waterfalls, this drawback is of no great practical importance in the qualitative use of the system. 1) Magister dixit : Horowitz & Hill, The art of electronics, 2nd ed., p. 275.